In the project in progress „Transformation of Experience“ (see Wiencek & Lauke 2011), Stephanie Sarah Lauke (KHM Cologne) and myself are currently working with an informal approach to documentation. We are developing an approach to (re)mediate the aesthetic experience of a video installation into a digital display by developing a simulative and a transformative display model, which should highlight the experiential possibilities of the installation, with the goal of offering a meta-experience or at least a mental representation of possible experiences of the installation. Thereby our research focuses on the theoretical implications and limitations of a translation of experience and strengthens the interpretative component of these transformations. The aim is to create an understanding of the possible experiences in a specific installation and to find a workable solution, which can be used in everyday documentation work. In the project we develop a simulative approach, where we use virtual 3D space as target display for translation of a moving image installation, whereas in a transformative approach we attempt to adapt and actualize the structure of installative works towards the language and affordances of the target medium for documentation, while attempting to enable a meta-experience for the user. In this project the subjectivity and transformation of the experience is an interpretative process, where we have to make assumptions based on our own subjective experiences and the knowledge of the artistic concept. In my previous post I defined informal documentation – in relation to what I called „formal“ documentation – as a subjective point of view, a personal interpretation and expression, where the sum of individual perspectives can lead to a broader image of an art project. In this post I want to explore some other aspects of informal documentation of media art projects. Looking at the word informal more closely, several attributes, which describe the characteristics of documentation, come to my mind. In the following I will walk you through my thoughts about this little wordplay. Let me start with the aspect of information. A documentation informs the recipient about an art project through communicating an abstract, mental representation of it. But following Claus Pias’ (2003) notion of information theory, information „is not about what is said, but about what could be said“ (Pias 2003, 1, translated by the author); a concept which strengthens the potentiality of the documentation. Following on this, an informal documentation should go beyond the factual surface and should affect the viewer, talk to our senses, convey a meta-experience, i.e. a mental representation of what the experience of a project could be like. This is especially important if you can’t experience the project directly, but have to rely on a (re)mediation of it. This also means that such a documentation should involve the documentarist’s own as well as other visitor’s personal experiences and therefore, as shown in the project „Botaniq“, the documentation becomes a subjective, (co-)creative expression; a work in its own right which maintains a relation with the documented art project. As I have already mentioned in my previous post, an informal documentation is a starting point rather than an endpoint in the sense of Jon Ippolito’s description of a label in his text „Death by Wall Label“: “Wall labels are the pins that fix the butterflies of new media to museum walls.“ Instead of trying to fixate an art project, any documentation of a media art project (also a formal one) should always be in formation. In the same way in which the documented projects are process based – and therefore they are constantly evolving or, at most, they reach a temporary endpoint – their documentation can never be finished, but can only be a work in progress if it wants to capture the processual nature of the project. But even more, if one takes the notion of documentation as a starting point for re-experience, conversation and active interpretation seriously, documentation should ideally evolve and get richer through the engagement of the users and by them adding to it. This follows the concept of critical art mediation („Kritische Kunstvermittlung“) of Carmen Mörsch (2011), which advocates for producing new knowledge together with the visitors and fostering their personal reflection and interpretation of an art project. According to Eva Sturm an artistic project can serve as a source for inquiry, and for the exploration of the project artistic methods can be employed or the artistic process of the project in question can be taken up (cf. Sturm 2011). This process of knowledge production needs an open and co-creative environment. However, a documentation is also formative in the sense that it forms the recipient’s view on a project. It is a construction, something formed in itself, shaped for example by decisions about what to include or exclude, by archival politics, or by it context of production and presentation. Any documentation is also formed by decisions regarding the representation of the data. This includes the materiality and mediality of the documentation, i.e. the characteristics of a medium itself, which in itself constrains its accessibility and affordances. If the documentation is digital or it is presented in a digital form, the software and the interface determines our perception of the data or the media artifacts as well as our possibilities to interact with them. Software in turn is a cultural product itself, based on decisions made by software developers (cf. Manovich 2011), and interfaces have their own grammar of actions and metaphors (cf. Manovich 2001). They shape the „inbetween“ between the user and the documentation. At the same time these factors shape the creative possibilities and production of a documentation and can be creatively employed when thinking about documentation as creative expression, as interpretation and as translation. This is especially true for art projects, where interfaces play an important role, which have to be translated to provide a meta-experience. Another interesting aspect with regard to mediality is the indexicality of documentation, especially if the latter is created by using an automated process. How „real“ is the image that a documentation delivers? If one looks for example at the indexicality of photography (in the sense of semiotics), its direct connection to the depicted seems to be evident at first sight in that photography is regarded as a mechanical reproduction of the real world. But if one thinks of staged photography, where – as A.D. Coleman (1983) defines it – the photographer intentionally creates events to photograph them, for example by interfering with real events, and something happens which would not happen without the action of the photographer. That way the image rather depicts the inherent reality of the image (Bildwirklichkeit), which is created with and for the image. Even if the process of capturing might be regarded as „objective“, the inherent staging and framing makes for a subjective point of view. Therefore it doesn’t refer to actual, but to a potential past, leaving it up to the interpretation of the viewer to complete the image (cf. Blunck 2010, 14/15). This strengthens the role of imagination in forming an image of an art project in the recipient’s head. To enable this imaginative process, it is important to leave space for the own interpretation of the viewer. Norman M. Klein (2009) argues, when writing about database novels, that the use of disruptions in the exploration of data creates gaps and absence to be filled by the imagination of the “user”. These gaps foster mental interactivity with the narrative and are the spaces where new knowledge can emerge by fostering the active interpretation of the recipient. This opens up documentation for co-creative knowledge production. To summarize: an informal documentation should go beyond informing about formal aspects of a project towards taking up its formative potentials and convey a meta-experience of a project by employing the formal qualities and affordances of a documentation creatively. Informal documentation should be an evolving co-creative process of knowledge production involving visitors, documentarists and artists, acknowledging the multiplicity of „potential pasts“ (quoting Sheila Dillon, Duke University), leaving spaces to mentally involve the recipients and fostering their own interpretation to complete a mental image of an art project. Blunck, L. (2010). Fotografische Wirklichkeiten. In L. Blunck (Ed. ), Die fotografische Wirklichkeit. Inszenierung – Fiktion – Narration (pp. 9-36). Bielefeld: transcript Verlag. Coleman, A.D. (1983). Inszenierende Fotografie. Annäherung an eine Definition [amerik. 1976]. In: Kemp, Wolfgang (Ed. ): Theorie der Fotografie III. 1945 − 1980. München : Schirmer/Mosel. 239-243. Ippolito, J. (2008). Death by Wall Label. Retrieved January 8, 2010, from http://thoughtmesh.net/publish/printable.php?id=11. Klein, N. M. (2009). Spaces Between: Traveling through Bleeds, Apertures and Wormholes inside the Database Novel (pp. 137-152). In: P. Harrigan & N. Wardrip-Fruin (Eds.). Third Person. Authoring and Exploring Vast Narratives. Cambridge, MA; London : The MIT Press. Manovich, L. (2011). There is only Software. WRO 2011 Reader – 14 Media Art Biennale WRO 2011 – ALTERNATIVE NOW. 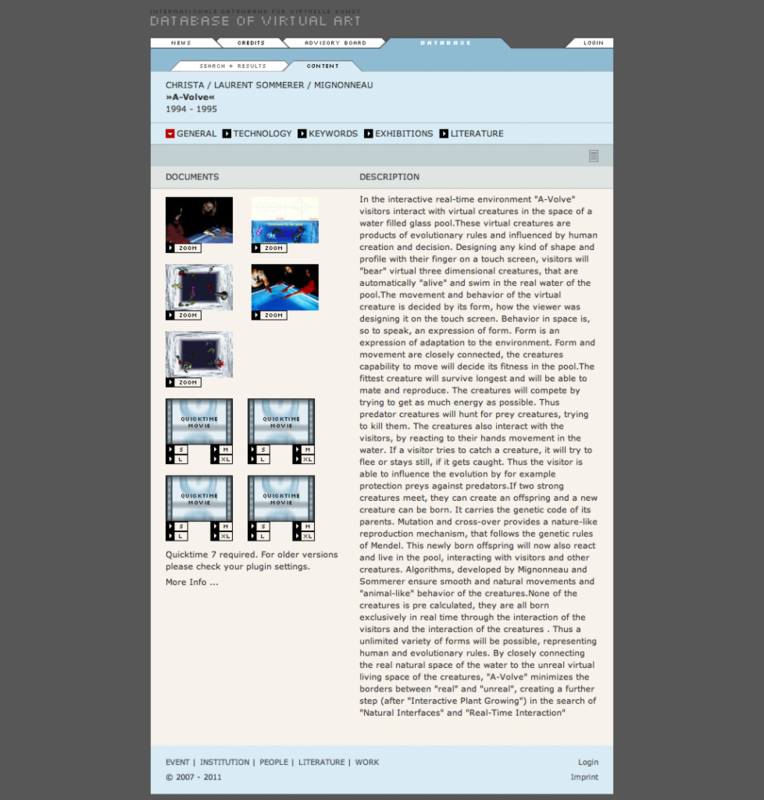 Retrieved April 13, 2011, from http://wro2011.wrocenter.pl/site/reader/manovich_en.pdf. Mörsch, C. (2011). Allianzen zum Verlernen von Privilegien: Plädoyer für eine Zusammenarbeit zwischen kritischer Kunstvermittlung und Kunstinstitutionen der Kritik. In N. Lüth & S. Himmelsbach (Eds. ), medien kunst vermitteln (pp. 19-31). Berlin: Revolver Publishing. Pias, C. (2003). Das digitale Bild gibt es nicht – Über das (Nicht-)Wissen der Bilder und die informatische Illusion. Retrieved June 15, 2009, from http://www.zeitenblicke.historicum.net/2003/01/pias/index.html. Sturm, E. (2011). Von Kunst aus spucken. Vermittlung und (von) Medien/Kunst (aus). In N. Lüth & S. Himmelsbach (Eds. ), medien kunst vermitteln (pp. 62-70). Berlin: Revolver Publishing. Wiencek, F. & Lauke, S. S. (2011). The Remediation of Experience. A Case Study. Proceedings of the ISEA 2011 conference. http://isea2011.sabanciuniv.edu/paper/remediation-experience-case-study.